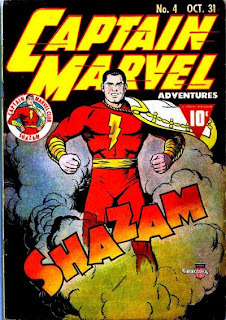 Now I've covered Captain Marvel most notably here, in my A Sense of Wonder feature, which mostly talks about why DC has continually failed to utilize him effectively since acquiring him in 1974. And there are, of course, comprehensive histories of Captain Marvel elsewhere on the net, such as here on Newsarama, so I'm going to focus my attention on one simple thing: Captain Marvel vs. Superman. 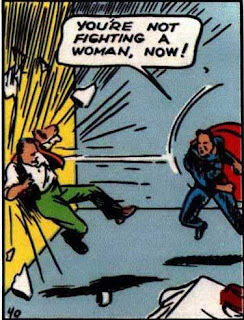 In 1950, Captain Marvel was ruled by Judge Learned Hand to be infringing on Superman's copyright. Although the trial process itself was longer and more complicated (you can read about it here), the ruling was absolutely fair and just, since Bill Parker and C.C. Beck, the creators of Captain Marvel, were told explicitly by Roscoe K. Fawcett, circulation director of Fawcett Publications, to "give me a Superman, only have his other identity be a 10- or 12-year-old boy rather than a man." (source: COMIC BOOK MARKETPLACE #120, March 2005) That simple fact alone is enough to justify the court's ruling that Captain Marvel, a flying strongman with black hair who often fought a bald scientist, was infringing on Superman's copyright. What we as fans of today must remember is that it was also a different time. The superhero genre was new, and still getting off the ground. Had Captain Marvel come out today, there would be no legal action. He is significantly different, significantly distinct enough from Superman. And in many ways beyond the superficial, it was actually Superman who was changed in order to be more like Captain Marvel. Let's look at these differences now, shall we? Certainly, the concepts of Superman and Captain Marvel differ greatly. However, did you know that it should have been more different? Bill Parker's original idea involved a hero named "Captain Thunder" leading a squad of lieutenants, each one imbued with the powers of a god. Fawcett didn't like that idea, and Parker and Beck kept coming up with more ideas, each time being nixed. Fawcett just wanted a carbon copy of Superman, and Parker and Beck didn't want to give it to them. The solution: make a hero who is superficially like Superman but is completely different, especially in character. And thus, Captain Marvel was born. The biggest difference between the two heroes, of course, is the secret identity. There is a certain amount of relatability and wish fulfillment in both Clark Kent and Billy Batson. Clark Kent takes off his glasses and reveals an incredible man. He is living life as a pretense, and it is instantly relatable on a wish fulfillment level in that every kid would like to be able to "show" his superiors exactly how great he could be. In contrast, Billy Batson is not living a pretense; he is really a 10-year-old kid. 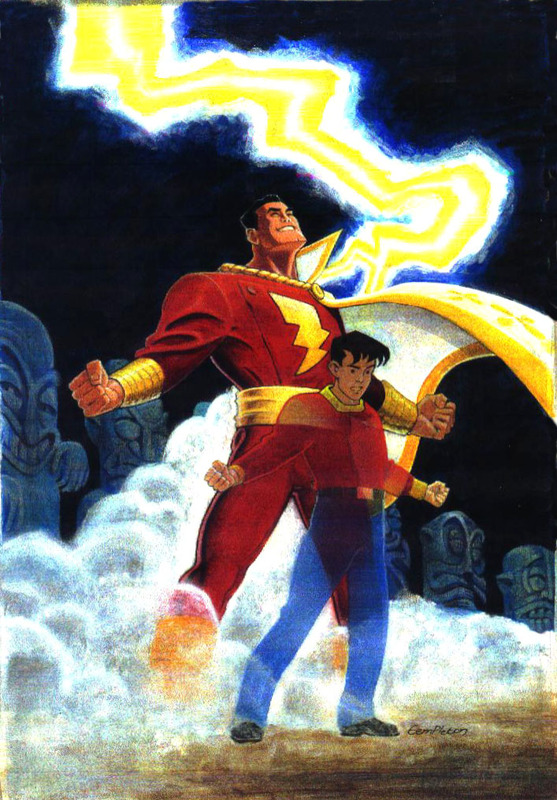 As a 10-year-old kid, he gets into adventures, and when he gets into too much trouble, he screams "SHAZAM!" and turns into Captain Marvel. His is the ultimate wish fulfillment story — every kid wishes they could be like that. And I think that's the biggest difference in terms of their most basic concepts: one hides his true self, while the other one is his pure self. Yes, they both fly. Yes, they're both fast. Yes, they're both strong. Yes, they could both do anything the story called for. Two of those sentences apply to something Superman did first. The other two were started by Captain Marvel. If you guessed speed and strength for Superman, you'd be right. Superman is indeed the first superstrong, superfast superhero. But Captain Marvel flew first. 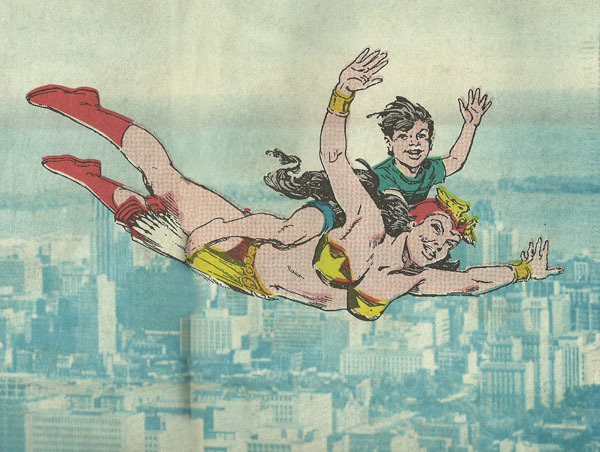 As pointed out by the Marvel Family Web, he's been flying since his fifth appearance, WHIZ COMICS #5, cover-dated June 1940. In contrast, Superman first recorded instance of flight was in May–June 1941, and he didn't start flying regularly until October 1943. It should also be noted that Superman's flight ended up coming from the cartoons from Fleischer studios, as it was easier to animate. These both came out at approximately the same time. The other thing that Captain Marvel started is the ability to develop other powers as the plot calls for it. With the wisdom of Solomon (in addition to the strength of Hercules, the stamina of Atlas, the power of Zeus, the courage of Achilles, and the speed of Mercury), Captain Marvel could do anything the story needed. He could walk through walls, he could build machines, whatever. He was a walking deus ex machina, much the same way that Superman would later become (to an unparalleled degree) in The Silver Age, with powers like super-ventriloquism and super-intelligence. Much of this can be attributed to Otto Binder, who was Captain Marvel's main writer in the 40s and who became one of Superman's main writers in the 50s and 60s. Binder was a truly influential, if underrated, writer in the world of comics, and you can learn more about why here. Marvel pulling on a piece of string from another dimension. In contrast, the Superman stories were rather crude, and in fact, when Siegel and Shuster were shopping it around to newspaper strip publishers, they were often rejected because the work was so crude (even by Will Eisner). They were given a chance by what is now DC Comics because they needed material to print. The Superman stories were a big hit due much more to their primal power than their technical excellence. 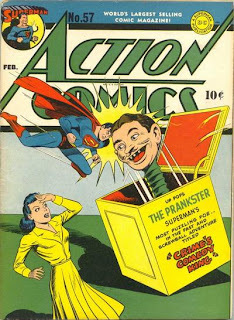 As seen above, Superman added the Prankster to his rogues' gallery soon after Captain Marvel had proven to be a big hit. 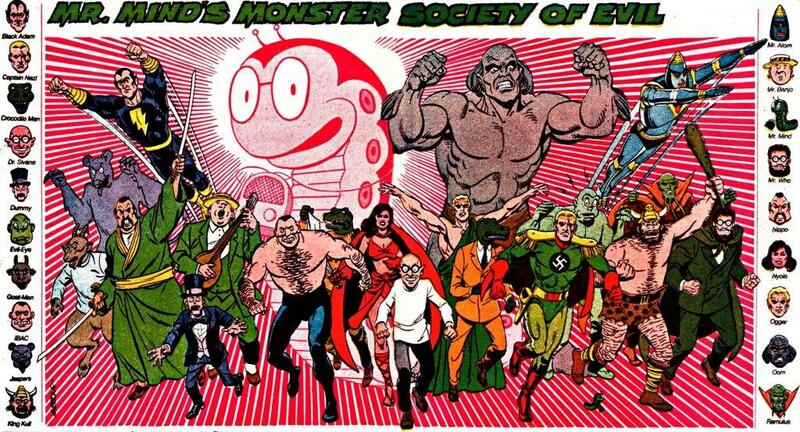 At the same time, Superman also added another villain named the Toyman to his rogues' gallery. It strikes me as too coincidental that such introductions to a character's world that would have seemed incongruous to the character at the time would be merely coincidental to the Good Captain's success. 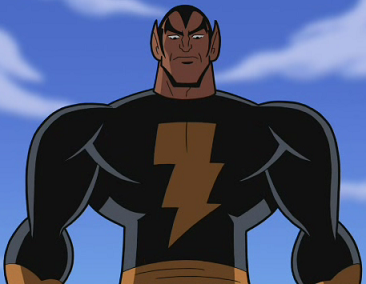 I'd like to point out one very important villain in the Shazam! mythos, and that's Black Adam. Created by Binder and Beck, Adam was Captain Marvel's opposite number, basically an evil version of the hero. He appeared in exactly one story in the Golden Age, and is now widely used. That's longevity for you. Everyone should watch THE BRAVE AND THE BOLD. Now. Hop to it. I'm not sure if he was the first of his kind in the superhero genre — he could be — but he preceded Bizarro, Superman's by 13 years. Bizarro was also created by Otto Binder, with artist George Papp. One misconception, however, may be the one that states that Captain Marvel was fighting a bald mad scientist before Superman was. Yes, it's true that Dr. Thaddeus Bodog Sivana first appeared in February 1940 in WHIZ COMICS #2, the same issue containing the first appearance of the Big Red Cheese, as Captain Marvel is often called. This was February 1940. Very few comics in the 40s looked this good. Heck, very few comics now look this good. 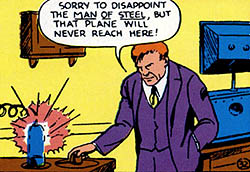 It's also true that Lex Luthor first appeared in April 1940, two months later, with a full head of red hair. So yes, Dr. Sivana came before Lex Luthor. 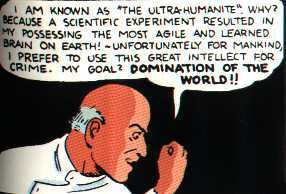 But he did not come before the Ultra-Humanite, who debuted in June 1939, and was a bald(ing), tiny mad scientist. It was when an artist's error made Lex Luthor accidentally bald that the Ultra-Humanite was written out of the Superman series. So yes, while it's true that Captain Marvel's arch-enemy came before Superman's arch-enemy, Sivana did take his cues from a Superman villain. So I don't like seeing that argument used. What we can say, though, is that Captain Marvel had one of the most inventive and diverse rogues' galleries in comic books. 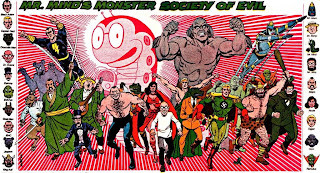 The formation of The Monster Society of Evil took two years' worth of Captain Marvel comic books, and was the first epic serial story told in American comic books. No idea why Black Adam is here. He shouldn't be. In contrast, Superman had the Ultra-Humanite, Lex Luthor, the Prankster, and the Toyman. Oh, I'm sure he had more, but none that ever made an impact, whereas most of Captain Marvel's villains are still being used to this day. This is another aspect in which the two characters greatly differed. Superman's supporting cast pretty much revolved around Clark Kent's life at the Daily Star (later the Daily Planet). 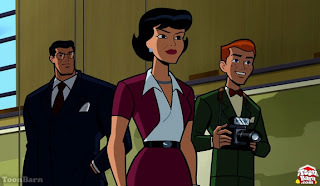 He had editor-in-chief George Taylor, cub photographer Jimmy Olsen, and rival reporter/love interest Lois Lane. There was no loss of economy with this cast; everyone had a role to play and everyone existed to advance the plots of stories. Taylor would send Clark out on assignment, Lois would try to scoop him, and Jimmy would get in trouble. Seriously, watch BRAVE AND THE BOLD. Now. Captain Marvel's supporting cast, on the other hand, was fairly different. He also had co-workers, such as Billy Batson's boss, Sterling Morris. But he also had comic relief characters such as Uncle Dudley and the talking tiger, Tawky Tawny, further adding to the whimsy of the feature. And of course, they had the Wizard Shazam, from whom all powers came. But the most important difference in terms of their supporting casts, I think, come from the fact that Captain Marvel had a Marvel Family — a team of superheroes with the same motif. From left to right, we have the Lieutenants Marvel, three boys all named Billy Batson (and thus are Tall Billy, Fat Billy, and Hill Billy), further adding to the whimsy of the series; Captain Marvel Jr.; Tawky Tawny; Captain Marvel; Uncle Dudley/Uncle Marvel; and Mary Marvel. Not pictured is Hoppy the Marvel Bunny. 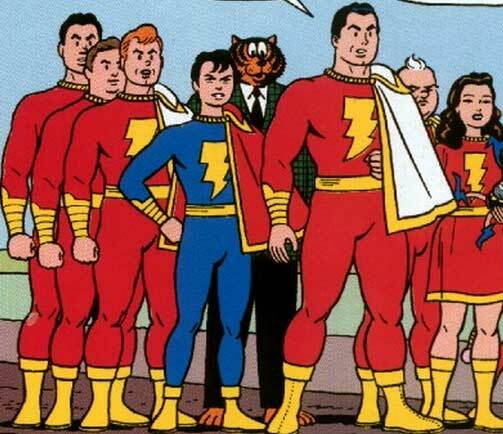 The most important of this crew are, of course, Captain Marvel Jr. and Mary Marvel. 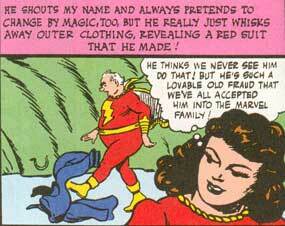 Mary Marvel debuted in CAPTAIN MARVEL ADVENTURES #18 in December 1942. She was created by Otto Binder and Marc Swayze. She preceded Supergirl by over sixteen — 16 — years. Tellingly enough, Supergirl was also co-created by Binder, this time with Curt Swan on art. Captain Marvel Jr., created by Ed Herron and Mac Raboy, debuted in December 1941 in WHIZ COMICS #25, predating Superboy by four years. 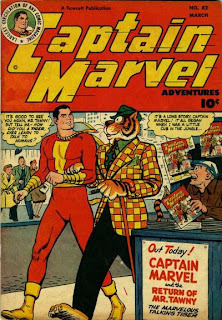 If you've ever wondered about Captain Marvel's influence, consider this: Elvis Presley modeled his look after Captain Marvel Jr.
Again, just in terms of diversity and prolificness here, the edge has to go to Captain Marvel. It's not inherently better, as the Superman stories were really created to be economical and fast-paced, with a spotlight on Superman, while the Captain Marvel stories were about Billy Batson and Marvel was just a plot device. But if it had to come down to who had the better supporting cast regardless of context, I have to go with Captain Marvel's. 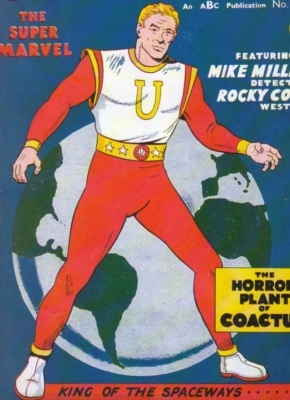 Captain Marvel spawned a lot of imitators stateside, but he also spawned many an imitator overseas. The most famous of this is Mick Anglo's Marvelman, who was created in the 50s specifically to replace Captain Marvel in their local comics when Fawcett folded (the Brits loved Captain Marvel so much that they went out of their way to create a blatant replacement). In the 80s, he was brought to the United States by Alan Moore, Alan Davis, and John Totleben as Miracleman, and was one of the true game-changing characters of the time, as one of the first superheroes to get the deconstruction "if superheroes were real" treatment. Miracleman was Mike Moran, who would say the word "KIMOTA!" (read it backward) and turn into a superhero. Like Captain Marvel, he had two sidekicks, Young Miracleman and Kid Miracleman. I also want to note Mick Anglo's other Captain Marvel–inspired creation, Captain Universe. According to InternationalHero, Universe says "GALAP!" and gains the powers of Galileo, Archimedes, Leonardo da Vinci, Aristotle, and Pythagoras. I have no idea what that means, which makes me want to find some of his old 50s comics. But you can see him in Moore and Kevin o'Neill's LEAGUE OF EXTRAORDINARY GENTLEMEN CENTURY: 1910 . I'd also be doing you a disservice if I didn't mention the Philippines' own Mars Ravelo. It could very easily be argued that Mars Ravelo was the most important creator in the history of Filipino komiks, and it's easy to see he had great taste, because he, like Anglo, had two characters that took their cues from Captain Marvel. The first is the more blatant (right down to the name) Captain Barbell, who originally was a scrawny dude named Tenteng, who'd lift a magic barbell and turn into Captain Barbell. The other one, created with legendary artist Nestor Redondo, is Darna (originally Varga). Narda, a Filipina child, swallows a magic stone, yells "Darna!" and effectively switches places with or causes an alien warrior woman named Darna to manifest on earth through her. Learn more about Darna here. Driving up the Captain Marvel similarities even more is this recent fan fiction piece released by Gerry Alanguilan and Arnold Arre. It is a Darna story inspired by Moore's MARVELMAN. 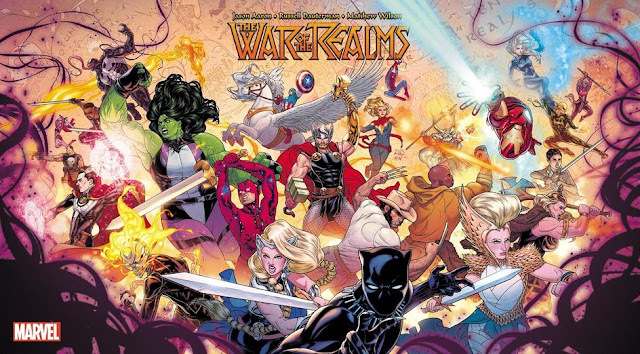 The basic premise for the story — an aged Narda/Mike Moran forgetting about their superhero lives and leading mundane ones, only to rediscover their powerful identities later on — can work with anyone under the Captain Marvel engine. Of course, none of the above answers the truly important question, which is who would win in a fight? WE! MUST! KNOW!! 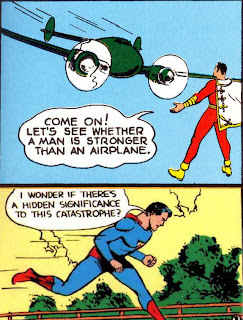 It of course depends on which period of time we take these guys from (obviously a full-powered Captain Marvel would wipe the floor with "I can't fly at all" Superman), so we'll work off of their prime states, at which point Superman takes the cake here. In his prime, Superman could literally move planets. Captain Marvel was never that strong. And before anyone pulls out the whole "Captain Marvel is magic and Superman is vulnerable to magic" argument, I'll have you folks know that because he changed with magic lightning, Captain Marvel is also vulnerable to magic. Furthermore, he is also vulnerable to electricity, such as lightning bolts and those emitted by eels. Unless Captain Marvel starts off the fight with kryptonite in his vest, I don't see him winning. On all legal grounds, Captain Marvel infringed on Superman's copyright. The superhero genre was barely a decade old when the decision was made by the courts, and the decision was more than understandable. It's kind of like someone coming up with a "light orb" after Thomas Edison had invented and patented the light bulb. But I hope that in the course of this article, I've convinced you that, if you thought Captain Marvel was just a Superman ripoff, that's not the case, and that he is an important, significant character in the history of comics. He proved that you could do all-ages stories that could stand the test of time — I just read some Golden Age stories to my niece, and she absolutely loved it. With Captain Marvel, Bill Parker, Otto Binder, and C.C. Beck proved that comics could be capable of great art that would appeal to everyone. In closing, I'll leave you with these words from Scott Tipton, he of Comics 101. "It doesn't matter if it was the 40s, the 70s, or today -- readers who discover Captain Marvel as kids always seem to fall in love with him." 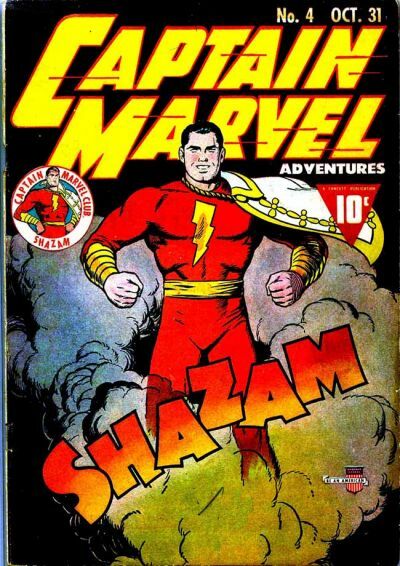 If you have kids you want to read comics to, I can't think of many other comics that I would recommend than the Golden Age Captain Marvel. Here's to Bill Parker, C.C. Beck, and Otto Binder for giving us one of the greatest characters in the history of this medium, Captain Marvel! I've read different versions. One was (I think) that Fawcett appealed this decision and (here it gets hazy) won the appeal - meaning the whole thing would have to be looked at again, with the final decision yet to be determined. However, as comic sales were falling, they decided there was no point in funding a hugely expensive defense, so voluntarily took the decision to stop publishing Captain Marvel. As for Marvelman, as he was a blatant imitation of CA and this fact is an admitted part of the character's history, surely DC, as the copyright holders of all things Shazam, could sue Marvel/Disney for plagiarism? I'm not sure. 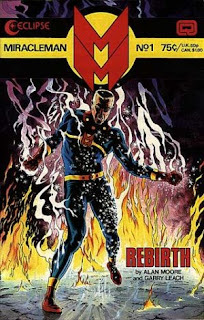 I would suppose that the defense would be that things like Miracleman, Supreme, and all that other stuff has been published in the last 25 years, so why are they picking on it now? And it's not like DC at this point isn't guilty of doing some ripping off themselves. At this point I think it's a live-and-let-live situation. Excellent article. I think, though, that Ben 10 is a Captain Marvel imitator once removed. 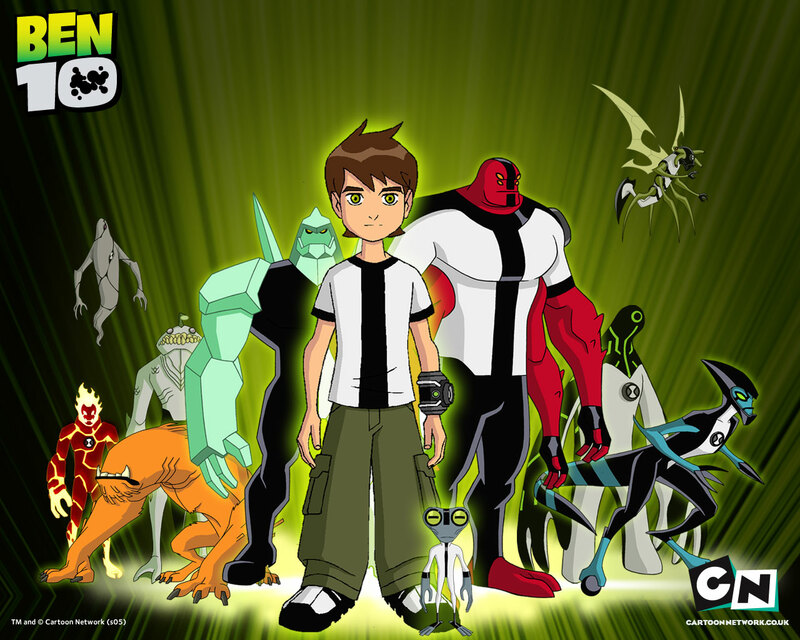 The creators of Ben 10 have stated that their inspiration was the 1965 DC Comics series Dial H for Hero, featuring a boy named Robby Reed who owned an extra-dimensional device that changed him into random superhero forms. But Dial H was a clear copy of Captain Marvel, so the connection is still there. I suppose DC would argue that, although it was common knowledge in Britain regarding Marvelman's genesis, it wasn't so well known in America - or, at least, they (DC) just recently learned of it. I think you're right about the 'live-and-let-live' situation, but maybe they're keeping it up their sleeves for a rainy day. 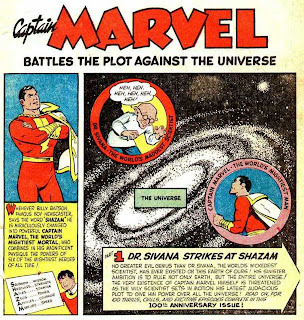 The Captain Marvel moving stars and planets in the 40's (Captain Marvel Adventures #28, 95, 97, 98, 106, 138; Marvel Family #61; Whiz Comics #154). 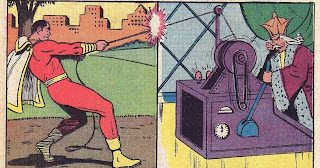 He destroy planets with a single punch (Captain Marvel Adventures #43, 141). In terms of Captain Marvel's imitators, how could you fail to mention the original version of Marvel Comic's Thor (back when Dr. Donald Blake turned into Thor, before he was retconned to be the actual Thor in mortal form)? Treated as less powerful than a fully healthy adult? Check. Check. Transforms with a lightning bolt? Check. Check. Powers from the gods? Check. Check. Despite all his other superpowers, most often depicted as a flying tank? Check. Check. Evil brother figure (or literal brother)? Check. Check. Whimsical sense of humor? Check. Uh . . . Okay, they're not entirely alike. 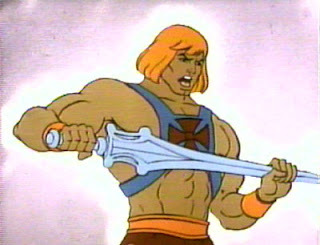 Also, He-Man has more in common with a now-forgotten but briefly popular Hanna Barbera cartoon called Young Samson and Goliath. Both transform in an explosion of power, and both then direct the energies of their transformation at their pet, whcih transforms into a superpowered animal (a superpowered lion named Goliath for Young Samson, a superpowered green tiger named Battlecat for He-Man). Shazam is more powerful then superman under a blue sun. Which is supermans strongest form. Dc should sue . And get that marvel name back to the captain. And get to take any one character they want from marvel. Never thought about that, but you have a point. And Hulk would be another as would many others in a far reaching sort of way. "Superman could literally move planets." Captain Marvel could literally move planets!!! "That simple fact alone is enough to justify the court's ruling"
I disagree. Being super-strong, capable of flight, etc. either is or isn't specific enough to be copyrightable. And if it isn't (and note that nobody NOW would argue that it is, as there are multiple superheroes today who meet that description but are owned by different companies), then the fact that one character was intentionally based on another doesn't suddenly make it copyrightable. This is a very well-written and researched article, and your slight misinterpretation of the verdict should not take away from the great job you have done in comparing these two characters. Judge Hand specifically stated in his verdict that while the differences between the two characters was not sufficient grounds for defense against a claim of copyright infringement, the similarities were not enough grounds to claim it was. The fact was that Fawcett was not trying to deceive potential customers into thinking they were buying Superman comics, or that Captain Marvel was Superman himself./ Had they done that, then it would be copyright infringement and unfair competition. What was indisputable copyright infringement, however, was from the testimony of a few artists that they were specifically told to copy Superman stories. Though Fawcett editors denied this, both the the judge in the initial case and Judge Hand in the appeal found that yes, there was copying.